Chapter 25 service project team working together and packing meals to make a difference in the lives of those all across the world. The senior-level class, Leading People and Projects (MGMT 411), provides a semester-long project for business students called Strive to Thrive Lincoln, helping them gain knowledge of philanthropy in the Lincoln community. Students receive hands-on experience focusing on what it takes to manage a grant proposal process which ultimately awards $10,000 to local non-profits made possible through a gift by Rhonda Seacrest. Students also volunteer their service on outreach projects. As part of the class team structure, the social media team is updating the Strive to Thrive Lincoln student blog. Students will compose regular updates outlining their experiences from week-to-week as they go through the grant proposal process. We are the social media team of the class and will be creating weekly content in the form of Instagram, Twitter, Facebook, and this student blog. Our team consists of six members; Ashley Richters a senior marketing major from Aurora, Nebraska; Toby Boyer a senior management major from Forest Lake, Minnesota; Bailey Charling a junior marketing major from Oakland, Nebraska; Connor McManigal a senior management major from Fremont, Nebraska; Catelyn Orel a senior management major from Blue Springs, Missouri; and Madi Dangerfield a management major from Grand Forks, North Dakota. Wow...what a week. It was our final day for deliberations on Monday and you could feel the intensity as you walked into the room. Everyone knew how important our discussion would be that day and you could feel something important was at stake. Every student has their own opinions, and nonprofits they are passionate about. Throughout the class we debated on giving money to all five finalists, giving it to only three, or only one which was the major point of discussion. With so many options our discussions got pretty heated, but ultimately came to what we believe was the best decision. For our final decision we decided that CLIA, Center for Legal Immigration Assistance, would receive $7,500 and Food Fort would receive $2,500. It took so much back and forth to come to this decision, but we were ready to move on to our ceremony on Wednesday. Food Fort and the Center for Legal Immigration Assistance were awarded $2,500 and $7,500 respectively as part of the Strive to Thrive Lincoln grant process. Wednesday rolled around like any other day, but we knew that it wouldn’t be just another day for our finalists, and especially our winners. Our awards ceremony team did such a great job organizing the event and helping set up so everything went so smoothly thanks to them. The students enjoyed mingling around atrium with the other staff, professionals and finalists that were there while munching on some of the great horderves provided. When everyone settled in our finalists each got up and introduced themselves and got to speak on behalf of their organization. In case you missed our previous announcement those finalists were obviously our two winners that I mentioned earlier, CLIA and Food Fort, and then Lighthouse and No Footprint Too Small. After announcing each of the winners many of us couldn’t help but become emotional because of the impact that we know will soon be made. The excitement on each of the recipients' faces were priceless and were a highlight of the entire semester. We ended the ceremony thanking each of the task groups who have put in so many hours to make this semester possible. But lastly, we had to thank Dr. Messersmith for leading the charge for us and guiding us the whole way through. This class has been such an amazing and unique experience that I know we will take with us for the rest of our lives. Thank you for being a small part, but nonetheless important part in our semester and supporting us through this process! Students whittled down the non-profit applicants from 32 to 5. This week certainly did not disappoint in our Strive to Thrive class. Both Monday and Wednesday consisted of further discussing all of the nonprofits that are currently in the running and there were definitely some intense and difficult discussions, but our class handled them all with class and in such a respectful manner, learning and listening to other peers and the perspectives they were coming from. Deliberations was nothing short of enlightening and it was nice to hear others opinions. So many of the students in the MNGT 411 class are clearly passionate about these NPOs, and it was hard to eliminate them. After this week, our class have five finalists. Bailey Charling one of our class members spoke on this, “I feel like I can vouch for our class in saying that deliberations were hard. It was hard to choose five NPOs when all of them were great.” This could not be truer going from 32 applicants to five was the most challenging thing we had to do all semester. I think another realization that our class had come to is just how amazing our community really is and how many people out there are doing great things to make the lives of others better and create a better future for the world. Another member of our class, Kemery Myers, also spoke on our class deliberations, “The deliberations for our finalists were as rewarding as they were taxing! Each person cares about each NPO (nonprofit organization) so much that no decision was made effortlessly. We know that we have the best organizations, so it’s really exciting to get closer to our ultimate decision.” As Kemery said, it was a very taxing process but our class is fully confident in the decisions that we have made thus far and are looking forward to deciding the final winners in the coming week! Site visit group presenting what they learned on their visit. This week’s class sessions looked a little different for our Strive to Thrive class. We had our group presentations on each of our site visits the groups went on so the entire class on Monday and Wednesday were completely student led. It was so interesting to hear how passionate and excited each group got talking about the site visits they went on and how easy it was for each of them to fall in love with the organizations they visited. Each group discussed the pros and cons of each organization and for many it was pretty difficult to come up with some cons, so our further deliberations next week will be very interesting to hear! We also learned about what each of the organizations did and how well their mission statement matched our goals as a class. One of the biggest points made was whether or not the services some of the organizations offered were preventive enough since that was something we discussed to be important when creating our mission statement. The other main discussion among the presentations were the proposed projects by each of the nonprofits. These proposed projects are what the nonprofits plan to do with the money that would be granted to them and how it would benefit their organization and ultimately the Lincoln and Lancaster county community. We are so excited to start our second round of deliberations next week and start to determine which organizations will move on to the final round of discussion and who will ultimately be chosen for the grant. We can already tell it is going to be such a tough decision as all of our current candidates are so strong and bring such valuable things to our community, but we cannot wait to see who makes the final cut! Class members on their site visits to CASA and CWH. This was such an exciting week coming off of Spring Break for our class! Each of our class members were assigned to two non-profit organizations this week for a site visit to learn more about each of the organizations first-hand. We learned valuable information about what the organization does, what they do within the community of Lincoln, what their proposed project is, got a tour of the organization and learned stories that have stuck out to them about their organization. One of our team members, Bailey Charling, visited The Hub and explained, “The Executive Director, told us a story about how a man has been working toward his GED for four years. On Wednesday he came in and told them that he passed his third test and only needs to pass one more to receive his GED. What stood out to me was how they helped him for over four years to reach this point. They never gave up on him.” She also mentioned that the Hub works with young adults age 16-24, but they continue to work with them even after they exceed the age limit. Another member, Ashley Richters, had the opportunity to visit Junior Achievement and Clinic with a Heart. “Being able to go on these site visits gave me the opportunity to learn so much more about the nonprofits. It was great to make connections with the faculty and staff and hear about their NPO daily operations. The best part is hearing the impact that they have made on individuals and the community as a whole. It is awesome to see the growth happening in the nonprofit world and in the Lincoln community," she said. Catelyn Orel took her visit to CASA and Cedars. “During both of my site visits it was clear to me how much energy and commitment everyone in the organization puts in to make the lives of others around them better. Both places were such selfless communities, but also great businesses that want to make the smartest decisions possible to best benefit our community. It was so encouraging for me to see the conscious effort that others are making to make direct connections with people who need help the most and educating themselves on the most effective ways to do so," she said. Lastly, Madi Dangerfield gained some great new perspectives during her site visits. “During the site visits, I had these moments of realization like ‘holy crap, these people and everything they are saying is incredible. I want to be like these people.’ The words 'building relationships' was heavily used during both my visits (to Food Fort and Community Crops). Despite the overall objective or name of the organization, they were all there to build relationships with the individuals they are working with. They want to listen and learn from these people, and I think that’s pretty special," she said. Overall, our classmates had such great experiences at each of the site visits that were attended and are excited to get back to class and share what we learned and experienced from each of the nonprofits. 3-15-19 - What are Your Values? Values were the subject of the week for Strive to Thrive students. Monday was a busy day for the Strive to Thrive class. We organized our class into groups to go visit each of the non-profit organizations that have made it to the top thirteen. We are excited to come back from spring break and jump right into these nonprofits to get a better understanding for what they do and who they are. We also went over a few different articles that we were assigned that discussed the importance of site visits and what to look for when attending them. Our discussion groups were filled with insight and things that we want to make sure to look for and ask nonprofits when we get to go on our own site visits here in the next couple of weeks. On Wednesday we took a step back from the non-profits and evaluated ourselves. We talked about our values. Dr. Messersmith designed a unique exercise for us where we were all given a sheet of paper with over one hundred values listed on it. We were told to circle all of the values that we believe apply to us and that we exemplify ourselves. She then gave us a blank sheet of paper and asked us to fold it into 16 parts and pick our top 16 values out of all of the words we had already circled. We then continued to narrow down our values four at a time until we came down to four total personal values. This exercise was more difficult than we thought at first because many of us hold so many values close to us, so having to focus them down to only four was challenging for most. It was so interesting to go through this exercise and really do some deep reflecting on what is important to each of us individually and also how that has been reflected in what we chose as a whole class as our mission statement for the semester. The importance of understanding our values is so great and ultimately determines what type of leader we will become. There are many values that you may aspire to have, but there are always a core few that will lead your actions and ultimately the way you lead your organization or team. This is “Leading People and Projects” after all. Students hard at work at Tabitha Foundation for the Meals on Wheels project. On Monday our class continued our deliberations from last week discussing further about nonprofit organizations that we believe align with our project’s mission for the semester. We ended up narrowing our list down to 13 non-profit organizations along with our priorities. Wednesday we took a break from the intense discussions to talk and reflect about each of the service projects that our students participated in. Our students split up into four different places: People’s City Mission, Matt Talbot, Tabitha Foundation-Meals on Wheels Delivery and the Chapter 25 packaging session. We broke out into these groups again on Wednesday and evaluated what things went well during each of the projects and what things could go better next time should the next semester’s class choose to use some of the same projects we have done. The most interesting part of the day Wednesday was going around the room and talking about all of the business takeaways from the organizations, but even more interesting the personal takeaways that people got from each of the projects that were done. A common take away our students spoke about during this exercise were the eye-opening moments they experienced or saw the different challenges that people have to face on a daily basis. This forced many of our students to be outside of their comfort zone and look at life through a different lens. We came away feeling very fortunate for the situations many of us are in and the opportunities that we have here specifically at the University of Nebraska. Most importantly we concluded that our time matters and that it does ultimately make a difference. It only takes an hour or two out of your week to make a large impact on someone’s life or help them meet basic needs that so many of us take for granted. What are you putting your time towards? 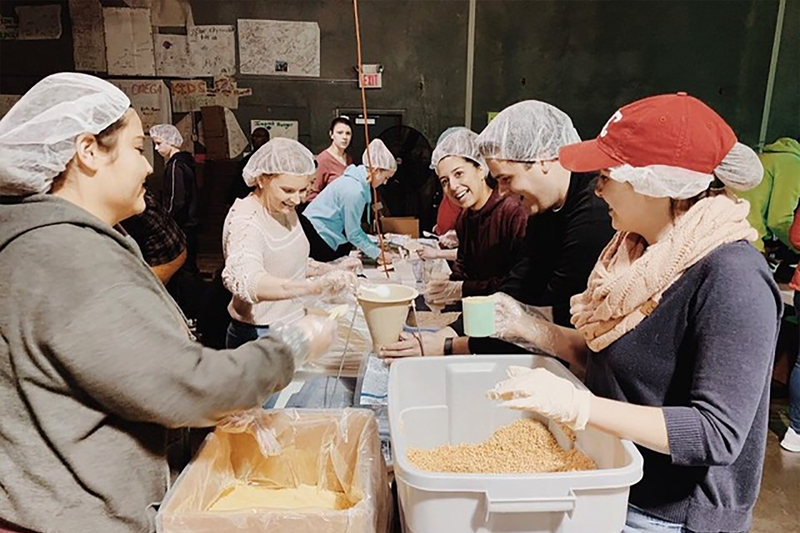 Our chapter 25 service project team had a great time working together and packing meals to make a difference in the lives of those all across the world. Another short week for the Strive to Thrive class but it definitely did not disappoint. As we mentioned last week, applications came to close and we received 28 applications! Wow! We spent the week closely reviewing each application individually and then taking a survey about each of the applications to help us get a better understanding about which organizations aligned the closest to our goals as a class and the impact we are trying to make on the Lincoln community. The Class Evaluation group then lead us in a discussion on Wednesday, comparing different organizations and discussing the results of the surveys everyone took. They did a great job at organizing all of the data so the whole class could see what the highest ranked nonprofit organizations were and then the organizations that averaged in the middle. We found from the data that there was a large portion of the organizations that averaged to be in the middle of the data so we spent the majority of the class discussing each of them and if we believed they should be further discussed to be in contention for the final grant or not. The discussion during class was great and we were able to hear opinions and perspectives from different people who were passionate about certain nonprofits or social issues. We also had our last service project on Wednesday at the Chapter 25 hunger relief organization. Our team had an amazing time together packing meals and helping set up the meal packing for the day. Chapter 25 is a great organization that strives to alleviate hunger all over the world. A child dies every 6 seconds from hunger-related diseases and the meal packs that Chapter 25 helps prepare and ship to third world countries helps the effort in making our world a better place and moving closer to ending world hunger. On a final note, our class is excited to continue our conversations about the different nonprofit organizations and get closer to our top 16 nonprofits that we want to visit! Students help prepare food at the Matt Talbot Kitchen. As far as class for this week goes, it was a little different since we had a snow day on Wednesday (yay!). Monday, we focused on the functionality of working in groups and how to better work as a group. In class, we split up into our task groups and finalized our schedules for the semester. The goal of this was to ensure each group is more organized and each member of the group has an assigned role and on the same age. Dr. Messersmith also had us do a fun exercise to reiterate why learning to groups is so important. She went around the room and split our task groups randomly into smaller groups, some groups of only one person, some two or three and some were even just told to work as their entire group of six. She then handed us a numbered sheet of paper and told us to come up with as many words as we could with the letter “k” in the middle. The hard part was the letter had to be exactly in the middle, for example, we could use the word “baker” but not the word “bake.” We had about two minutes to do this exercise and we found that for the majority of the class the groups that had more people were able to come up with more words. This just reinforced what we have been learning throughout this semester and the importance of working in groups and how doing it well can help us be more successful now and in the future. Many students completed their service projects this past week. Students went to the People’s City Mission, Matt Talbot Center and Tabitha Foundation (Meals on Wheels) thus far. Each class member has been positively affected by their visits and has now seen how these organizations are impacting the community of Lincoln in so many different ways. We’re looking forward to hearing about the rest of the service projects! To wrap this up, today is the final day for Lincoln/Lancaster County nonprofits to apply for the Strive to Thrive grant. We’ve been anxiously awaiting this day for weeks. Once applications close today at 5 p.m., the class evaluation team will begin their task of helping the 411 class members review applications. Next week we will start class discussions and debate to narrow down the applications to decide where we want to send the $10,000. Students participated in service work at People City's Mission. This week was all about perspective. We gained some insight perspective from the past grant recipients who spoke to our class on Monday. They spoke about what they thought of the awards ceremony and what they plan to do with the earnings they received from last semester’s Lincoln Strive to Thrive grant. They also answered some valuable questions from multiple task groups ranging from informing the finalists who could possibly win the grant to what each of their organizations does and what impact they have made on the community. We also went over an article that covered the differences between serving, helping and fixing. To the average person reading this blog those words may all coincide for you, however, our class has learned differently. This article called "The Service of Life" by Rachel Naomi Remen redefined all of these terms for us. Serving is different from both helping and fixing. Helping often implies that you are doing someone a favor or there is an expectation of return on the other side. When we fix something or someone we are viewing that person as less than or broken. The issue with this is that creates an unsaid barrier between you and the person where there is no real relationship involved which only creates a posture of inequality. Our class is focused on serving. Serving in a way that we see no differences or brokenness, but only the opportunity to give with no expectation in return. This is the mindset we want to have going into each of our service projects in the upcoming weeks, an attitude of equality and a posture of servitude. After kicking off a few service projects already at People City Mission, our class is looking forward to the three service projects coming up and gaining even newer perspectives learned in the process. Students take time out for a class picture. This week was all about learning to work effectively and efficiently in our 411 teams. We spent a good portion of Monday in our task groups discussing our Gallup Clifton strengths and learning how to use them to our advantage. Regan Burnham, a Clifton strengths coach, spoke to the class more in-depth about strengths and their meanings and initiated discussion among teams on how we can use our strengths to enhance our group experience throughout this semester. Students were given several handouts to assess group communication skills thus far, which helped us find ways to be the most successful while working with one another. One handout asked questions regarding past experiences in group projects, our positions within groups, how we felt our team has performed and areas we want to progress. The other handout compared our team members’ strengths where it showed us our strong areas and others that might be lacking in four categories: executing, influencing, relationship building and strategic thinking. Every team then decided upon rules that would govern our teams for the rest of the semester. We signed these contracts as promises to each other to abide by the new rules. At the end of class, students signed up for volunteer opportunities organized by the service project team. Wednesday, we discussed the difference between charities and philanthropies. The social media team presented to the class about the importance of creating awareness for Strive to Thrive in the community and reaching different nonprofits so they know about our grant opportunity. We also encouraged students to reach out to nonprofits that they are passionate about to encourage them to apply. Also this week, students are finishing up their NPO interviews. We were given the assignment to interview a nonprofit of our choice in the Lincoln community to understand the behind-the-scenes of an NPO. Over 50 nonprofits were interviewed by a 411 class member. This has been a great avenue for our class to learn more about different nonprofit organizations, promote what we are doing and get the word out about the grant opportunity. To end this week's blog post, we would like to announce that we received our first official application for our grant! If there is a nonprofit that you feel passionate about and believe fits our mission statement, please let them know that applications are live and waiting for submissions! We can’t wait to see future applications! Strive to Thrive Lincoln provides Nebraska Business students in the Management 411 class with the opportunity to grant funds to organizations that empower City of Lincoln/Lancaster County families by proactively connecting them to resources that help improve health and/or stability. This was a busy week for our Strive to Thrive class! We started the week out with another amazing guest speaker named Lori Seibel. Seibel is the current president and CEO of Community Health Endowment of Lincoln (CHE). As she spoke to us it was easy to see how passionate she is about the health of our community and what CHE is currently doing to serve that. CHE goes much deeper than just the surface health needs. They look beyond just physical issues that are apparent but look at a system called “ACEs” that measure the adversity that someone has faced throughout their lives. Our class learned how important and related ACEs are to someone’s physical and mental health which ended up having a large impact on what we wanted our entire mission to be about. It was a heated class period on Wednesday, as we started discussing and debating ideas about our mission statement for the semester. Fifty-one students with different passions, pasts, and personal experiences worked together to agree on a mission statement that would determine what nonprofit organizations would be able to apply for our grant. Safe to say, it was not a walk in the park. We were editing the statement as we were walking out of the class; it took nearly an hour and a half for us to finalize it. With that being said, here it is! Our 2019 Spring semester mission statement. Saying we are beyond excited to introduce this to the public would be an understatement. Every team (publicity, site visits, class evaluation, etc.) in the class has been working hard to guarantee a successful semester. We are looking forward to beginning the application process and hearing from all of the amazing NPOs in the Lincoln/Lancaster County area. Class Mission: Strive to Thrive Lincoln provides Nebraska Business students in the Management 411 class with the opportunity to grant funds to organizations that empower City of Lincoln/Lancaster County families by proactively connecting them to resources that help improve health and/or stability. Bryan Seck, Director of Workforce Development for Prosper Lincoln, came to our class to help educate us on what to look for in a non-profit organization. And we’re off! Our class, Leading People and Projects or as the project is called, Strive to Thrive Lincoln, has officially kicked off and we are so excited to see what this semester holds! What makes this class so unique is that we have the opportunity of awarding $10,000 to local non-profits here in Lincoln that has been generously donated by Rhonda Seacrest. Throughout the semester our class also gets the chance to visit local non-profits, volunteer for service projects and ultimately facilitate the decision-making process for where the grant money will go to. This past week we had a guest speaker, Bryan Seck, come to our class to help educate us on what to look for in a non-profit organization and also on the many reasons behind poverty and other local social issues that Lincoln faces. Seck is the Director of Workforce Development for Prosper Lincoln and has such a passion for helping the local community and educating others on how to better their current situation. Our class learned so much from him and we plan on implementing our new knowledge going forward this semester.